ALCIDE PINEAU and DORIS L. PINEAU vs. MIGUEL TAVARES ALMEIDA and ISABEL C. V. ALMEIDA. This is a boundary dispute between abutters in Westport. Plaintiffs seek a declaration that their land extends to an iron pin set in the ground or, alternatively, that they have acquired title to the same area by adverse possession. Additionally, they seek a declaration that Defendants have committed a trespass, monetary damages and a permanent injunction enjoining Defendants from further entry upon the land. This action was originally filed in Bristol County Superior Court on June 2, 1989 and was transferred here under G. L. c. 221, §26A, on Plaintiffs' motion, November 13, 1990. A trial was held on July 17, 1991. A stenographer was appointed to record and transcribe the testimony. Ten Exhibits (some with multiple parts) were introduced into evidence; all of them are incorporated in this Decision for purposes of any appeal. Defendants' motion for Directed Verdict was denied. Plaintiffs' motion for Directed Verdict on Defendants' demand for damages was taken under advisement and is hereby granted. The following witnesses testified: Normand Pineault ("Normand") (brother of Plaintiff Alcide Pineau) and both Plintiffs, all for Plaintiffs; and Robert A. Hartnett, a registered land surveyor, for Defendants. 1. Sanford Road is a public way in Westport, running in a north-south direction. Plaintiffs, husband and wife, and Defendants, husband and wife, own abutting lots on the easterly side of Sanford Road. Plaintiffs' lot, numbered 180, is north of Defendants' lot, numbered 184. 2. Plaintiffs' and Defendants' lots were originally part of a larger tract owned by Ovila and Alexina Pineault ("Ovila and Alexina"). Ovila and Alexina are the parents of Plaintiff Alcide Pineau and Normand. This larger tract, containing about 7 acres and 33 square rods was acquired by Ovila and Alexina in 1943 by a deed recorded at Bristol County Southern District Registry of Deeds (all recording references in this Decision are to that Registry) at Book 869, Page 387 (Exhibit lA). The frontage on Sanford Road in the 1943 deed is 201.75'. 3. In 1949, Ovila and Alexina conveyed part of their land to Albert Bosse and Rose Bosse by deed recorded at Book 955, Page 327. This Bosse lot was in the northwest corner of Ovila and Alexina's parcel and had 65' frontage on Sanford Road. Then in 1956 Ovila and Alexina conveyed out the rest of their parcel, by three deeds: the first was to the Bosse's, adding to their land a triangular sliver, having 6' frontage on Sanford Road, Book 1185, Page 379 (Exhibit lC). A second lot was conveyed to Plaintiffs by deed recorded at Book 1185, Page 380 (Exhibit lD), having 65' frontage on Sanford Road. The third lot was conveyed to Normand and his wife, Pauline, by deed recorded at Book 1185, Page 381 (Exhibit lE), having 65.75' frontage on Sanford Road. 4. At the time of the division, Ovila and Alexina instructed Plaintiff Alcide to set iron pipes into the ground to separate the lot to be deeded to Normand from the lot to be deeded to Plaintiff Alcide. This was done in the presence of Normand. The southerly boundary line of Plaintiffs' lot, also being the northerly boundary line of Defendant's lot, is the area in dispute. 5. In Plaintiffs' deed, the southerly boundary line is described as being marked by two iron pins, one of which is at Sanford Road. The same two iron pins are referred to in the northerly boundary line of Normand and Pauline's lot. The northerly boundary of Plaintiffs' lot is described, in both the second Bosse Deed and the deed into Plaintiffs, as being marked by a stake (at Sanford Road) and an iron pipe. I have attached a copy of a portion of Exhibit 4, a plan prepared by witness Hartnett's company. I have added a few notations. In particular, I have marked a dot labelled "Pineau Pin" at the approximate location of the iron pin or pipe which is referred to as being at the Sanford Road end of the southerly boundary of Plaintiffs' lot (northerly boundary of Defendants' lot) in the deed into Plaintiffs. 6. After acquiring title to their lot, Plaintiffs constructed a house, which they moved into in 1958. A garage was constructed on the south side of the house. A driveway runs from the garage straight out to Sanford Road. At the time of the trial Plaintiffs had resided in the house for 33 years. 7. 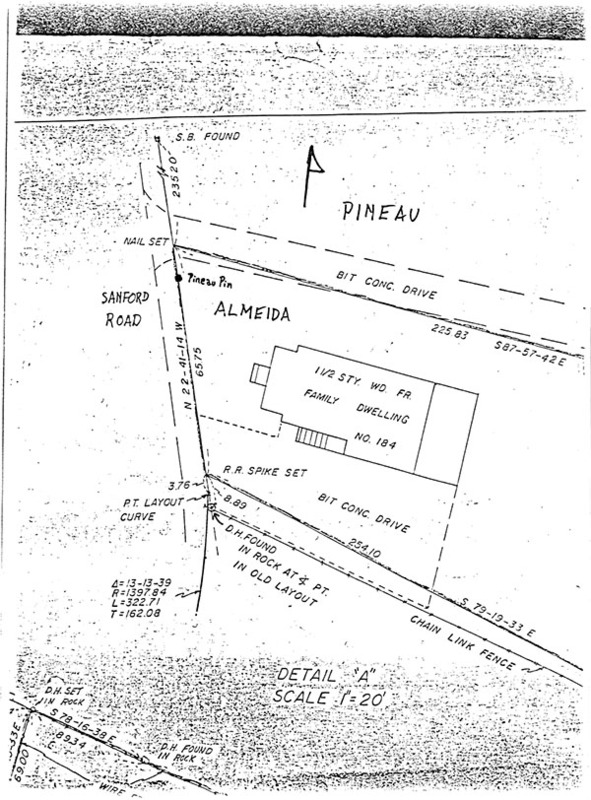 Plaintiff Alcide testified that he buried the Pineau Pin while landscaping in 1958. The Pineau Pin has been uncovered and is shown clearly in a hole in the ground, Exhibit 7E and 7H. 8. On April 22, 1963, Normand and Pauline conveyed a small portion of their lot, located to the rear of Plaintiffs' lot, to Plaintiffs by deed recorded at Book 1408, Page 382. This portion is not in dispute. 9. On May 29, 1963, Normand and Pauline conveyed the remainder of their lot to Hilda Bento by deed recorded at Book 1408, Page 390, in which configuration the property passed, after intervening conveyances, to Defendants by deed dated August 12, 1982, recorded at Book 1845, Page 985 (Exhibits lH to lL). 10. The deed from Ovila and Alexina into Normand and Pauline describes the disputed boundary line by distances and by references to iron pins. The deed out of Normand and Pauline into Helen Bento describes this boundary line by distances only. No mention is made of any iron pins or pipes. The same is true with all subsequent deed conveying Defendants' parcel, including the deed into Defendants. I attach no significance to the absence of reference to the pins. The deed into Normand and Pauline describes a granite bound at the southeasterly corner of their lot (on Sanford Road). The next bound is by a stone wall 255'. The 1943 deed into Ovila and Alexina also refers to the 255' bound by a stone wall. Plaintiff Alcide and Normand testified that the front portion of the stone wall was removed prior to the deed into Normand. It is not unusual that a reference to such a monument would be continued in deeds even though the monument had been removed. Both Alcide and Normand testified that there is a drill hole in a boulder at the Sanford Street line and, indeed, Defendants' surveyor, Mr. Hartnett, found a drill hole in a rock at that location. The drill hole is labelled "D.H. Found in Rock" on the attached. I conclude that that is the location of the former end of the stone wall mentioned in the various conveyances of the Defendants' lot. 11. Defendants had their lot surveyed by witness Hartnett and contend that the boundary line between them and Plaintiffs begins at the easterly side of Sanford Road, 8.89 feet north of the Pineau Pin, at the location shown as "Nail Set" on the attached. This would place the boundary line in Plaintiffs' driveway. Mr. Hartnett based his conclusions on measurements from stone bounds he found on Sanford Road north and south of the original 1943 lot. He did not find the pins which are referred to in the deeds described above. He gave too little credence to the drill hole in the stone and to the chain link fence, both shown on the attached plan. I find that the chain link fence is in the location of the removed stone wall. 12. Plaintiffs' contend that their southerly boundary line of their lot begins on the easterly side of Sanford Road, at the Pineau Pin, and I agree. 13. If the Pineau Pin had not been buried, there would be little to argue about in this action. The various parcels coming out of Ovila and Alexina fit neatly together and together make up precisely the larger parcel owned by Ovila and Alexina. Their combined frontages on Sanford Road equal 201.75', exactly the Sanford Road frontage in the deed into Ovila and Alexina. I find no convincing evidence that the disputed boundary is where Mr. Hartnett and Defendants contend. 14. The first portion of the boundary between Plaintiffs and Defendants (the only portion in dispute) is a straight line starting at Sanford Road at the Pineau Pin (at its actual location in the ground) and ending at the westerly end of the 116.80 portion of the (undisputed) boundary line (which portion is shown on Exhibit 4 as having a bearing of N 88-19-46 E). 15. To deal with contentions of Defendants, my ruling does not have the effect of giving Plaintiffs 73.89' frontage on Sanford Road (an extra 8.89') instead of the 65' referred to in their deed. Defendants admit that the Bosse lot, north of Plaintiffs, has 71' frontage (p.1, Defendants' Memorandum of Law). Measuring 65' southerly along Sanford Street from the Bosse lot (Plaintiffs 65') a brings one to the Pineau Pin. Measuring another 65.75 feet southerly (as called for by the Normand Pineau deed and the deed into Defendants) brings one to the drill hole in the rock, at the end of the chain link fence. Mr. Hartnett's calculations raise the possibility that there is a problem between Defendants and their neighbor to the south, but there is no suggestion of that in the record. 16. Defendants contend that Plaintiff Alcide put the Pineau Pin in the wrong location, but I find that he put it in the correct location. The metes, distances and square footages in the various deeds do not argue to the contrary. 17. There are no grounds for finding that Defendants have any rights by adverse possession or prescription to the disputed area (and they claim none, beyond suggesting that they and their predecessors have mowed the grass). I agree with Defendants that Plaintiffs have not shown evidence of adverse possession with respect to the disputed area, but since they have record title to the disputed area, they do not have to. 18. I have no reason to believe that Defendants will interfere with Plaintiffs' ownership as established by this Decision so I will not grant a permanent injunction. Defendants are ordered, however, to remove, within 30 days from now, any fencing or other materials which they have placed over the boundary line as established hereby and to replace, within 90 days from now, the shrubbery which they damaged at the southwesterly corner of Plaintiffs' garage (unless within 30 days' from now Plaintiffs write Defendants requesting that the existing shrubbery be left in place).